Former President Lee Myung-bak is involved in several ongoing investigations by the prosecution, but it remains to be seen whether prosecutors will be able to hold Lee accountable as they get to the bottom of a bribery scandal and alleged political maneuvers by the state spy agency and the Defense Ministry during his presidency, as well as a slush fund case. The Seoul Central District Prosecutors’ Office has been scrutinizing the National Intelligence Service for allegedly running an online smear campaign to sway voter sentiment ahead of the 2012 presidential election. The Defense Ministry has been looking into suspicions that a military cyber command ordered its agents to post online comments in favor of the then-conservative administration. Former NIS chief Won Sei-hoon was indicted last month on charges of loss of state funds for spending 6.5 billion won ($6.12 million) of the NIS’ budget to run cyber teams writing online posts against liberal politicians. Won is under investigation for his alleged involvement in a wide range of politically motivated moves, such as peddling influence at public broadcasters and a crackdown on liberal politicians and celebrities. As for the military cyber command unit, prosecutors began the probe as they found that Lee had given an order to hire “people on our side” for the online smear campaign. 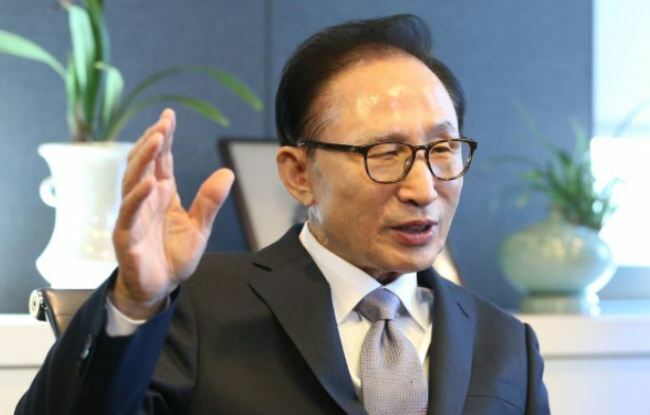 The momentum for the probe has weakened, however, after the court refused to issue a warrant for Lee’s then-Senior Secretary Kim Tae-hyo who allegedly delivered Lee’s order to the military, and after former Defense Minister Kim Kwan-jin was released from custody. The Seoul Central District Prosecutors’ Office is also investigating allegations that state agencies under Lee, such as the presidential office and a diplomatic mission abroad, helped auto parts supplier DAS recoup its 14 billion won investment in an investment advisory firm set up by a one-time business partner of the former president. DAS is under scrutiny by the Seoul Eastern District Prosecutors’ Office over suspicions that it ran a slush fund of 12 billion won under dozens of borrowed names, embezzled company money and evaded taxes. Lee’s elder brother holds a majority stake in DAS, but critics suspect the former president may be the real owner of the company. The latest probe involving Lee zeroes in on allegations that the presidential office received so-called “special activities funds” from the NIS while Lee was president, as it allegedly did under his successor Park Geun-hye. Last week, prosecutors interrogated Kim Paik-joon, Lee’s former secretary for administrative affairs, Kim Hee-joong, one of Lee’s private secretaries, and Kim Jin-mo, an ex-official at Cheong Wa Dae’s civil affairs office, over suspicions that they accepted about 500 million won from the NIS. Their residences have also been searched. Kim Hee-joong and Kim Jin-mo have reportedly admitted to some of the allegations. The court is expected to decide as early as Tuesday whether to issue arrest warrants for Kim Paik-joon and Kim Jin-mo. Whether the inquiries will expand to the former president depends on the statements of key figures implicated in the cases. Former NIS chief Won has denied all charges against him. Kim Jae-soo, who had represented DAS in a lawsuit to recover lost investment from BBK before being appointed by Lee as consul general of Los Angeles in 2008, is currently in the US. Kim Paik-joon, known as “Lee’s butler,” has reportedly denied Lee’s involvement in the NIS bribery case. Meanwhile, Chung Ho-young, a former independent counsel who investigated the BBK investment fraud scandal in 2008 and declared Lee innocent days before he was sworn in as president, disputed the accusation that he failed to do his job properly. In a press conference Sunday, Chung said the prosecution was to blame for the poor investigation as it did not search DAS offices or trace its accounts or follow up on his team’s findings.